one of me and another one for one of my luck readers. At this time, I would also like to showcase a quick peek into the pack. Since many of you request these types of posts, where I show you a peek into what I got in the mail. All I can say is that, this is an amazing cool tote bag. I actually took this tote to school recently and it holds up pretty well. It was extremely useful and I didn't have to carry my extra textbook on my arms. Also, the art work on the bag is amazing and it's really unique. Plus, the design on the back of this tote bag is stunning and I did get a few questions on the subway asking about this company. However, the only issue I had with this tote bag is the fact that it get dirty fast. Since my school is going through some renovations my tote got dusty fairly quickly that I anticipate. But still, in one wash it all went away and now it's perfectly back to normal. Hope this a helpful review for you all and I can't wait to find out which one of my lucky readers will win their very own tote bag. Hope you all like my little giveaway and review on this tote bag! "Whether you like classic style, fashion chic or urban function, here's the most desirable bag for you. The FRS tote bag is perfect to spread your word and charm across Berlin – and the world. Manufactured with organic love, the Berliner's favorite accessory is here and it's brought to you by FRS. 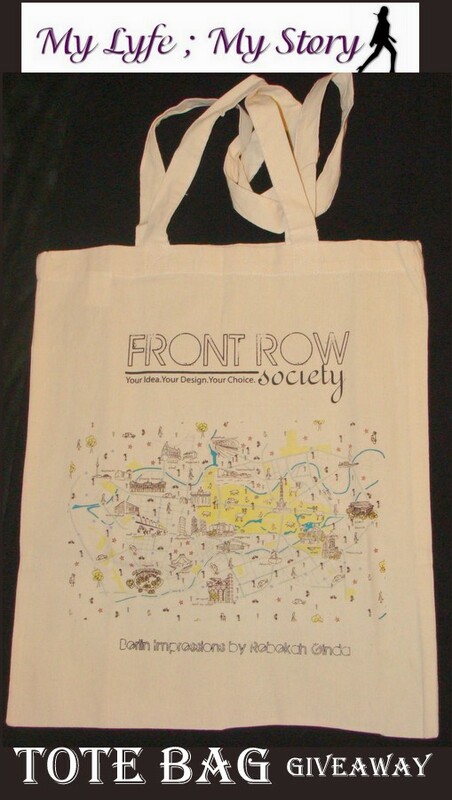 And because you'll want to wear it everyday, the FRS tote bags are washable and durable. Buy it now and take FRS for a walk, shall we? Sizes: 38 x 42 cm, long shoulder strap, 100% cotton. TYPE OF PRODUCT: Tote, COLOR: White, STYLE: Casual. Front Row Society gives €1 of every bag sold to the Ethical Fashion Forum. Front Row Society"
This is an international giveaway and it ends on Oct, 2, 2012 at 12 noon pacific time. Remember this is an international giveaway and it ends on Oct, 2, 2012 at 12noon Pacific Time. FTC: Front Row Society gifted me these two lovely tote bags as a gift for me and another one as a giveaway prize. I, myself decided to conduct a small review on the product since I found it really useful.